A Torah code documentary is being planned. See the promotional. The purpose of the documentary is to help us recognize that there are mysteries in the world that cannot be explained by ordinary mechanistic explanations. One of these mysteries are the Torah codes of which there are many illustrations on this website. Another mystery is the Mayan civilization, their writing, their culture, their astronomical observations, and their various calendars. Here we discuss some of the amazing coincidences, that are really not coincidences, involving the various people having roles in the planning and making of the documentary. The unlikely events that bring the making of this documentary together begin with conversations that Lee Cantelon had with producer Richard Shaw. Lee is a renaissance man with many talents. He produces professional music, is a brilliant photographer, art director, and film producer. Since 2003, Richard had been urging Lee for them to make a documentary on Torah codes. Here is what Lee recalls. My father, Willard Cantelon, was, among many pursuits, an ardent student of history. This was not an academic discipline, but self-motivated. Having exited formal schooling at a young age, he never gave up reading, and history, second only to the Bible, dominated his interest. His office, later as I recall it, was most often a labyrinth of books, folders, notes, and Babylon piles of typing paper produced prolifically from several generations of IBM typewriters. It is no surprise then, given his love for history and the Scriptures, that prophecy figured as equally prominent in his studies. "History written in advance," is how he once described the words of the Judaic prophets, as well as the first century writings that emanated from the disciples and converts of Jesus of Nazareth. Michael Drosnin's book, The Bible Code, and Jeffery Satinover's Cracking the Bible Code, were contemporary works that caught my father's attention in the mid-1990's, many times more dramatic and potent than Theomatics, which he had read decades before, a book that had prompted his correspondence with its author, Del Washburn. Shortly after this new discovery, Bible Code books were being delivered to the house on Vancouver Island, and with rapid order, wrapped in brown paper and posted with letters of introduction to close friends and associates scattered around the globe. On many evenings, while my mother was preparing dinner, we would relax in his study in the back of the house, overlooking a lilac tree and small patio, drink Nabob tea, and engage in what had become our favorite leisure activity whenever I was home, pleasant sparring over whatever preoccupied his current studies. The Bible Code took up a dominant role that stretched over several visits to the island. In Drosnin's book, and more so in the one by Satinover, my father found renewed validation that from these ancient texts a pattern, prophetic inspiration that spoke of a higher intelligence, might be realized. From the caves of Qumran, to the annals of the Wall Street Journal, he felt as if he too was on the trail of an approaching awakening to this reality. In the years that followed the publication of the Bible Code literature, which later he came to refer to as the Torah Code work, this became a constant thread reappearing in our talks. He would be as excited as a schoolboy at discovering the writings of Rabbeinu Bachya (Bahye ben Asher ben Halawa), and his moon cycles, or the words of Elhanan ben Isaac, the liturgical poet and author of The Secret of Lunar Intercalation (Sod Ha-Ibbur). "Imagine," he would enthuse, "that Bachya was able to decipher the secret of the new moon by using the same equidistant letter sequence in the Torah that Rips and Gans have reawakened, and this in the mid 1200's!" (For a complete explanation of the ELS that Rabeinu Bachya found see the first ELS.) Then he would gravitate to the spiritual significance of these revelations, and as much as he might value Bachy's moon discovery, it was how it related to a spiritual awakening that would most excite him, such as when Bachya stated, "If the eyes of your heart will be illuminated, you will find here precisely the code ... the wise will understand that this is not by chance, but a clear sign involving the very birth of the world." More than a decade later, I found myself sitting next to Professor Robert Haralick on a flight from Los Angeles to New York City. He did not realize how his conversation about current discoveries in the Torah Code provoked these memories. How could he? Nor, that our discussion, one which lasted nearly the entire duration of the trip, fit a growing pattern of awakened interest in the subject instigated by my friend, Richard Shaw, two years earlier. Interestingly enough, Professor Haralick had just finished giving a Torah code lecture in Los Angeles and was able to give Lee an in-depth Torah code tour using the lecture material on his laptop. It was this meeting that started the documentary ball rolling. And that is how it happened that the documentary is being produced with Richard Shaw as producer and Lee Cantelon as co-producer. Some while later, I returned from Japan, only to be invited to Israel to film a documentary on New Testament teachings given by a pastor reading scriptures at various locations in Israel. We had just acquired a new Canon high definition camera, and it seemed like an opportune time to capture comments by Professor Rips and Harold Gans in Israel. This took place, thank to Professor Haralick's arranging, in February of 2006, and was a first step towards the reality of a Code documentary that would present a true and distortion free record of a discovery of major implication. You can ask Professor Rips yourself tomorrow. He and Rabbi Glazerson are currently on their way to Los Angeles. Now let us read what Richard Shaw writes about his background and this meeting in Los Angeles. If I had a list of the ten people I had most wanted to meet, the brilliant mathematician Professor Rips would have been at the top of that list. The others wouldn't have mattered as much. What kind of a man would spend 30 years of his life trying to find a Code in the Torah? How many people would have thought he was crazy, and yet he continues on with the work. What miracle of destiny renewed the initial findings of Rabbi Weismandel in the 50's, and what gave Professor Rips the idea of how to search the Torah on computer? The whole idea amazed me. When I first was introduced to the "Bible Code," it was because of a trip that my former partner David McBrayer and I made ten years ago to Hollywood to produce a pilot show with the crew of Touched by an Angel. This happened before I moved to LA and we were staying at the Beverly Hilton, preparing to work on the pilot called Postcards from Heaven. The phone in my room rang that morning and it was my partner calling from his room, "there's a guy on Good Morning America talking about finding a 'code' in the Bible." I immediately switched on the TV. It was Michael Drosnin. We both ran out and bought The Bible Code and I started reading it on the return trip home. I remember the chilling verse that appeared in the opening pages, "But thou, O Daniel, shut up the words, and seal the book, even to the time of the end." On the cover was a picture of the matrix of the Rabin assassination. Eating at our favorite Japanese restaurant in Atlanta, we'd often contemplate the Code in those days, but because of the AIDS pandemic, we were asked to become involved in Africa and it resulted in us producing a TV series for SABC television (Johannesburg, S.A.). About a year later, we started on a feature film on the same topic, Beat the Drum which David wrote. It eventually won 30 International awards but was a very difficult film to distribute. I moved to Hollywood in 2001, primarily to work on movies. David was unable to move so I braved it alone, later started my own company, Pinlight. During those days, I mentioned to Lee that I had always wanted to do a documentary on the Torah Code, but had no idea of how to meet the people involved and didn't have an investor. Now, all of a sudden we were meeting with the team that discovered the code, (what I considered to be the world experts), and they happened to arrive just a few miles from my studio. Lee and I also met Rabbi Glazerson that day for the first time. I sat next to Professor Rips, a gentle and humble man, like an Old Testament Bible prophet come to life. He shows me the Patriarchal Codes he had found. After we'd talked for a couple hours, I asked him and Rabbi Glazerson about 2012, but they looked at each other - neither had any information to share. Rabbi Glazerson called me a couple weeks later saying that he likes my idea and plans to write a book about 2012 and the connections to the great-grandson of Shem and the Mayan Calendar: the long count Mayan calendar finishes a 5,125 year cycle on December 21, 2012. A few months pass. In the middle of the night, there is a knock at Lee's apartment and a friend wants him to meet a director that happened to be visiting next door. It's Philippe Mora, the director of the movie Communion (Christopher Walken) and several other films. Philippe is an interesting guy and is interested in the Code. He actually had letters from Emanuel Velikovsky, writer of the controversial 1952 book, Worlds in Collision. Lee and I write up a 10 part series idea. Philippe gets his lawyer to see if Discovery will take it. They decline -- saying that the Bible Code is "old news." In a sense, it gave me insight on how to position a Code special -- tying it with 2012, a topic that I had also been studying and that Glazerson now seemed excited about. When I Googled the topic, it came up with over a hundred million hits. You know you had nothing to do with coming to Israel. God is bringing people here that He wants to be here. I leave the store feeling stunned and after a few more days I returned home. Rabbi Glazerson later comes to New York and calls me -- wanting to meet. I ask if I can film him this time and he agrees. I decide to combine the Torah Code topic with the 2012 topic and create a 5-minute promo. LA Marzulli also agrees to an interview. This helped bring an American into the project that has a working knowledge of the Bible and prophecies without being "preachy." He says he'd be "honored." My wife Mary and I were driving one evening, and mentions that she never finished helping me find my "real" parents. I was adopted, and so I never knew my biological parents. In those days, all the info was kept secret. My adopted parents were wonderful people and were always afraid that my biological parents might someday change their mind and decide to come and get me. So the whole thing was kept secret. We had let the subject lapse for years hoping to not stir up problems with my biological parents - if either of them were still alive. Now having the internet, we discover I have a living step-sister and I got up the nerve to call her. We talked for a long time and I discover that my biological father was Jewish. She sends me pictures of the parents I never knew. I began to wonder what G-d was doing. Who am I? I discover that a mega-disaster film 2012 directed by Roland Emmerick was scheduled for release in July, but they could not meet their deadline and moved the release to Nov. 13th. We would still have to hurry and were still unfunded. Again, I'm working on a project and absorbing all the costs but when you believe that G-d is putting something together, it is not the time to quit. My friend Barry Morrow asks me to call him. Barry wrote the modern MGM classic Rain Man. He said that an investor had wanted him to write a movie about the Torah Codes, so Barry connects me with that investor. We discover that this man preferred to make a film without a collaborative effort. I had other ideas for the project. We had to have freedom to express what we wanted to. Michael Bernard Beckwith is a genuinely enlightened individual. He's someone that I respect and worked with on another film I directed called The Wordz Project. Through a sequence of events, I became acquainted with Courtney Dunham. Courtney worked for the company who produced the mega-selling The Secret and later became Michael's publicist. She got Michael on Oprah and Larry King Live six times over the holidays. She is intrigued with the Torah Code project and tells me she wants to devote the next year of her life to it. I asked her to see if Michael would interested in being involved. When the subject came up, Michael told her that he had a dream that he was supposed to be involved in some way in the Middle East. When she told him about what we were doing, he accepted immediately. Michael's time is always in demand, so having this type of entre with him is very unusual. They normally have stacks of invitations for him, and the process normally takes months, if he is able to do it at all. 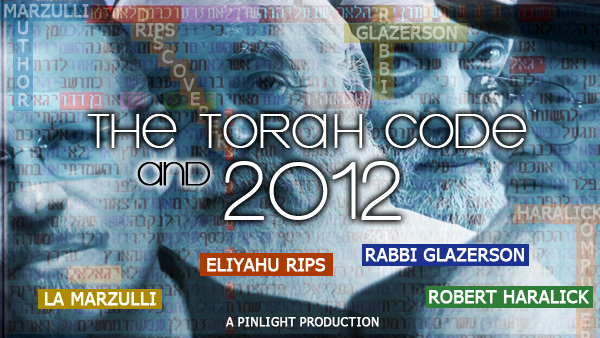 My film rep, Nichola Ellis who managed to get Beat the Drum into distribution wants to rep the Torah Code 2012 overseas. She just repped the short film Toyland that won an Oscar a few weeks ago. Toyland is about a Jewish child saved from the Nazis in WWII. Without additional prodding, Barry Morrow writes again and suggests I need to speak to Dan Gordon about the project. I met Dan about the same time that I met Barry -- about 7 years ago. Our group was working on developing another film at the time with a most unwieldy team -- a typical Hollywood story. Dan had written The Assignment with Ben Kingsley, Donald Sutherland and Aidan Quinn. It is a brilliantly directed little known film because the distribution company (Triumph Films, a division of Sony) was shut down only a month after the film was released. It generated its own cult following -- at that time on VHS. When I first saw the film, I was amazed at the level of expertise about Israeli security forces. Only someone who had had his own extensive experience could have written that movie. Dan was a captain in the reserves. He knew it all first hand. Over the years, I had lost contact with Dan, but had a high level of respect for him as a person and for his talent. My relationship with Barry and with Dan is something for which I am grateful to God. I had no idea Dan would be interested in such a project. A few weeks ago I got a call from a friend named Barry Morrow. Barry is a wonderful writer. He wrote the movie Rain Man with Tom Cruise and Dustin Hoffman. He won the Academy Award for his screenplay. I was lucky enough to write the stage adaptation of that movie and it just premiered in the West End of London last Winter and was, like the movie before it, a hit. Barry said that he had gotten a call from an acquaintance named Richard Shaw. Richard was doing a documentary about the Torah Codes and the year 2012. Barry asked if I was familiar with both subjects. I had heard about the Torah Codes and was intrigued with them and knew that the year 2012 was when the Mayan Calendar ended and that some believed it portended either the end of the world or the dawning of a new spiritual age. Barry said that neither were topics which were suited to him. But they were suited for me. This is the most important project in the world. I ask if he'll co-write the project with me and he accepts. This is only the beginning of unusual events surrounding Dan's involvement as you'll see if you read further. Rabbi Glazerson is in New York and meets a business man and investor who was influenced by his books. The man was interested in the project as described to him by Rabbi Glazerson. The two of us have a 20 minute phone conversation. The next day he flies into Hollywood and we talk. A generous man, he gives a homeless man $20 as I drive him back to his hotel. He tells me about a film that meant a lot to him, The Celestine Prophecy. I hadn't seen the film yet, but ordered a copy. Amazingly, Dan Gordon was one of the writers. I contacted Richard and told him I would be happy to help in any way that I could. I think that Richard was probably disappointed that I had shown up instead of Barry and of course who could blame him? I said why don't you have the professors run my name and see if it appears in the Torah Codes? If it does you know I'm supposed to be a part of this, if it doesn't, I'm not. After some prodding he agreed and relayed my request to Professor Haralick. Then he emailed me and asked me to supply my Hebrew name, birth date, and three Hebrew words describing my profession. My father's name was Abraham and thus my Hebrew name is Daniel Ben Avraham. My Hebrew birth date is the 15th of Iyar and the words which describe my profession were Tasritai, which means screenwriter, Sofer, which means author, and Machazai, which means playwrite. I set up a protocol trying three forms for the date and the three descriptions of Dan Gordon's profession. For the spelling of the month of Iyar, I chose the single yod spelling. If these experiments did not produce any interesting results I would try again with the double yod spelling. I found the following Torah code table. The search produced a cylinder size of 95. With expected number of ELSs set to 100, the probability that a text from the ELS random placement text population would have as compact a table as that produced by the Torah text is 2.5/1,000. This is the best result of the nine experiments. Repeating the same protocol with expected number of ELSs set to 50, the probability that a text from the ELS random placement text population would have as compact a table as that produced by the Torah text is 7.5/10,000. After realizing that the best table did not need expected number of ELSs set to 100, I reran the table with expected number of ELSs set to 50. 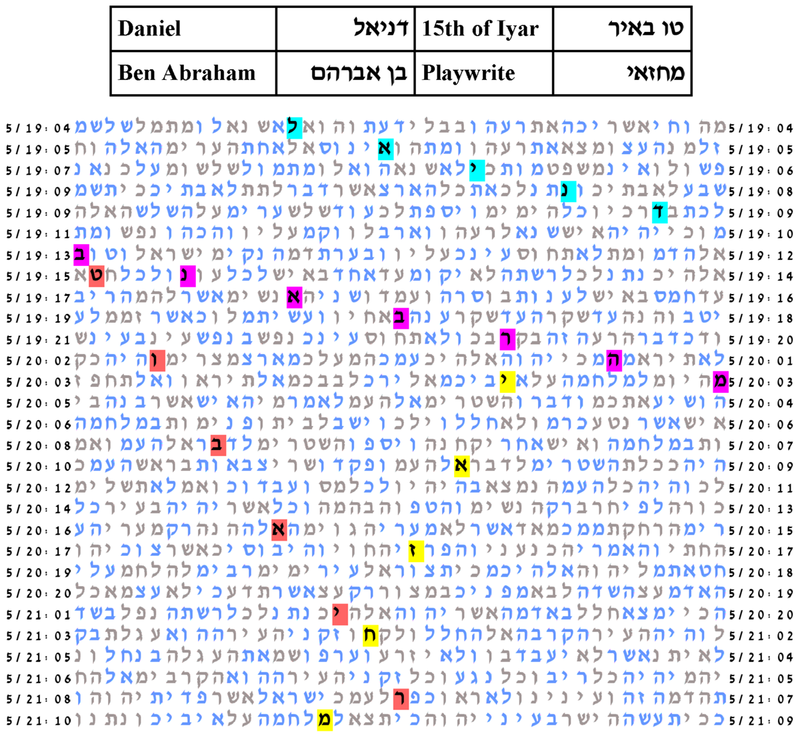 The probability that a text from the ELS random placement text population would have as compact a table as that produced by the Torah text is 7.5/10,000. The next to best result was with the key word Sofer, author, and the table produced was somewhat larger but in the same location as the best table. For this next to best result, with expected number of ELSs set to 50, the probability that a text from the ELS random placement text population would have as compact a table as that produced by the Torah text is 247.5/10,000.